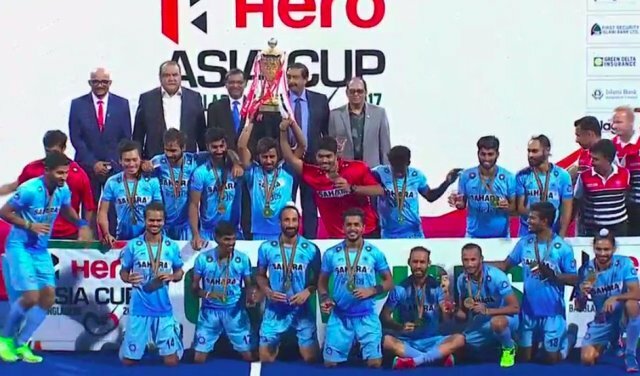 In yet another impressive performance, India defeated Malaysia 2-1 in the final to win the Asia Cup Hockey 2017 at Maulana Bhasani Hockey Stadium in Dhaka on Sunday. This is India’s first Asia Cup title in ten years, after winning it twice before in 2003 and 2007. Manpreet Singh-led India, who remained unbeaten and dominated till the very end. While the goals from Ramandeep Singh and Lalit Upadhyay helped the team to clinch the title. Malaysia kept up the pressure on the Indian defence in the final 10 minutes but the defence did enough to hold on.